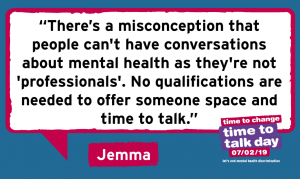 Today is #TimetoTalk Day. 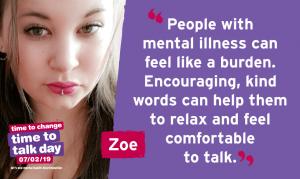 Conversations have the power to change lives, and you don’t have to be an expert to talk about mental health. 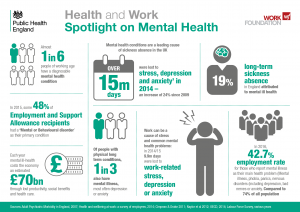 Still, too many people are made to feel ashamed because of a mental health problem. You can change that: however you do it, reach out and have a conversation about mental health today. Previous PostIn remembranceNext Post2018/19 AGM.